When you go out during the night when the sky is clear and look up, you see lots of small shining objects. It serves better when you are away from the city life where you can spend long hours trying to figure out the stars and traversing the constellations. It is much more than the map that shows up on every SkyNews issue. 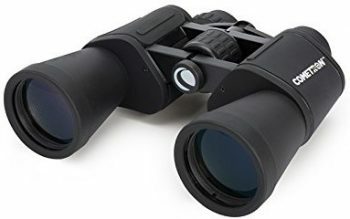 But for the best views, you’ll need the best binoculars for astronomy.When you have a red flashlight for night vision protection while sitting on a backyard bench, the next thing would be to follow the curiosity. Fortunately, binoculars have come to provide easy ways to take a look at the space swath from the comfort of your position. 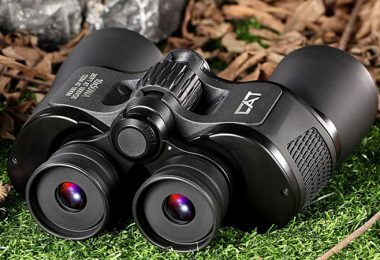 To have a better experience, then you need to look for the best binoculars for astronomy available in the market.Turning your binoculars towards the sky on a glittery night might surprise you because of how much they can expose. Using your eyes alone on a moonless night will, of course, make you see fewer stars than the numerous amounts viewed under the scope. There is always more on your plate since you will be able to spot the clusters and galaxies that appear closer to home.If you are always concerned about the sky life, then it’s time to read our guide before making the ultimate choice of buying one of the recommended choices. Before you jump to a conclusion, there are some things you ought to look at. 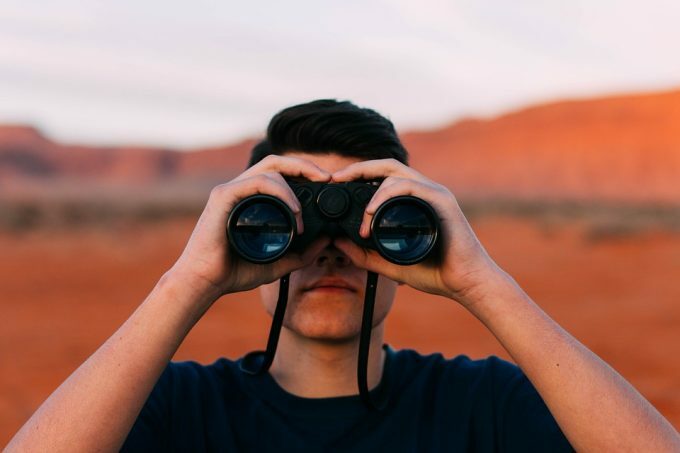 Other than the constraint of taste and preference, there are major issues that vary but are part of every pair of binoculars you’ll get hold of. We’ll provide you with what you need to know starting with the stronger points. How old are you for large binoculars? 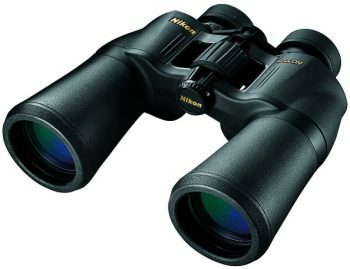 It’s where you have to start if you want the best binoculars for stargazing. Size is a factor to consider which you can determine by dividing objective size by the power. What you get is the diameter of a single ‘little circle’ on the looking end. The ‘little circles’ are what we call exit pupils. Going for high power binoculars means having small exit pupils. 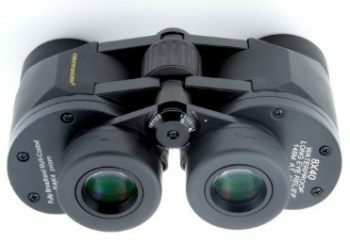 The 8×60 pair of binoculars, for example, will have an exit pupil of 7.5 mm. The exit pupils should fall on your eyes’ pupils. Our eyes change as we advance in age. So, an older person will have a smaller pupil opening diameter than the younger individual in comparison. In our table, the field of view column shows what you should experience when using the corresponding binoculars. The degree notation is what you will find on most binoculars. You can convert the degrees to feet at 1000 yards by equating one degree to 52 feet. The ‘x’. What does it mean? It is stamped on every binoculars mostly at the back or side parts. The ‘x’ that separates two numbers e.g. 8×56 is interpreted as ‘by’. The first figure on the left is the power of the magnification. The second one represents the metric diameter of the big glass lens at the front. Now, when you say ‘8×56’, it means that the object will be eight times larger on the 56mm objective lens. 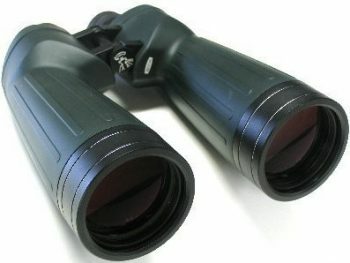 Water can condense on your binoculars or rain among other events that can make your pair of sky gazers become wet. So, it can be necessary to look for a waterproof pair depending on the circumstances. Most of the modern brands have their equipment rubber-cladded which protects shock too. Cheaper options may have an inbuilt water protection mode before leaving the factory. Some are air with water vapor sealed, so going for this choice would call for the nitrogen purged ones before closing up the optics. Prisms are inside the binoculars and their work is to turn the upside down image to its correct view. Let’s look at the two types that are commonly used. Porro prisms. Each of the Porro prisms has two right-angled prisms. 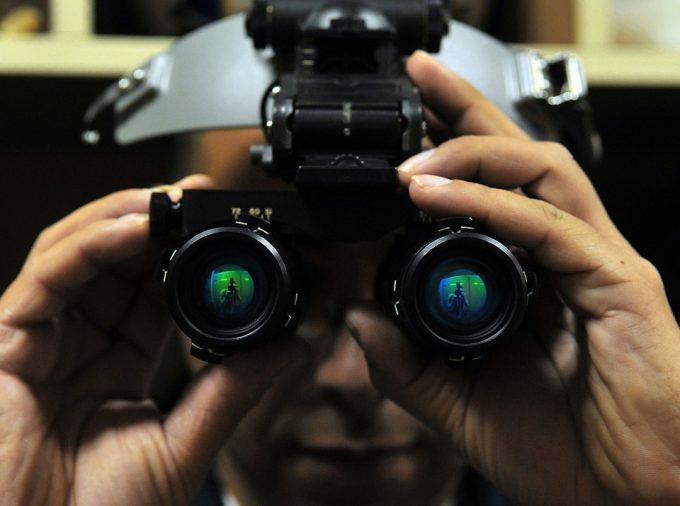 Since they are offset from each other, the objective lenses are placed far away from the eyepieces. 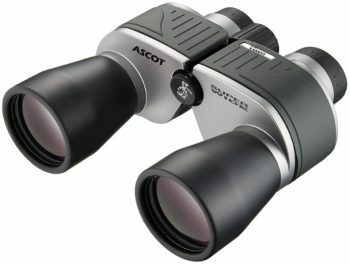 These makes the binoculars bulky but the performance is always better than the roof-prism types. The Porro-prism design needs less strict permissiveness making it easier to manufacture and the cost is also reduced. The yield is much better as the image is three-dimensional. Roof prisms. These types have prisms overlapped closely, making the objective lenses be in line with the eyepieces. What you get is streamlined and lightweight binoculars than the Porro types. The only disadvantage is that they take more time to manufacture and the cost is high. They also slightly lose more light to reflection – making them unfit for astronomical use but good for terrestrial viewing. Most of them are made from either BK-7 (borosilicate) or BAK-4 (barium crown) glasses. BAK-4 has a higher quality and the images produced are much better. This makes them more expensive. 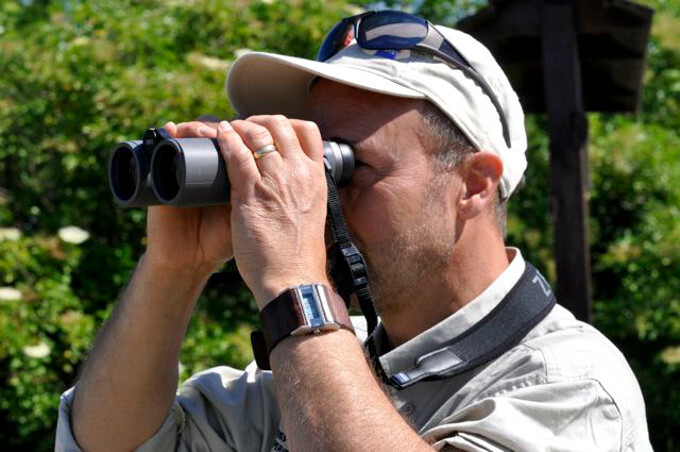 When using your binoculars, you want to see what you have spotted without having to move or zigzag around. You may also want to show it to your partner. Since your hands cannot guarantee a steady position, you go for a support system which prompts your binoculars to have a screw mount point for a stand. You can use a camera tripod, but it limits the swing as you try to face the device upwards. There are armed rigs meant for binoculars that can fit on sturdy tripods. More excellent ones come with articulated parallelograms so that you can switch through the angles. 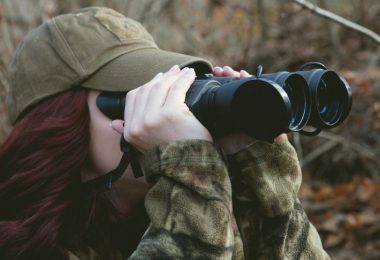 If you are thinking of owning a stand too, be prepared to spend almost the same amount as the binoculars. You might have more specific issues to address that we have not talked about yet. The above factors are the most common, and it’s what many manufacturers address, after getting recommendations and questions from customers. Now that you have the basics let’s get down to some of the top choices available in the market. Now that you know what you’ll need to look at in a top model, we’ll take a look at the top contenders. Any of them are great options, you’ll need to select one that does what you need. Description: The Oberwerk Mariner binoculars weighing at 4 pounds seems to be a device that you can tolerate during the whole distant-viewing session. For those who still have a telescope during the adventure, the pair becomes a perfect complement. A detailed view of the stars will be revealed to you when you use the Mariner, and it gets better as you gyrate the Milky Way. It has an impressive contrast that makes everything memorable. With an 8.4-degree FOV (field of view), you have what you spotted waiting to explore, making it a virtual universe stroll. Quality viewing is aided by the Porro-prism design and the optical path which are all vital contributors to mass factor. Other brands may also claim to have their equipment waterproof, but this one adds shock protection to the water-resistant feature. The internal optics are nitrogen-purged and sealed which protects them from fog especially during the winter. Light is needed which depends on the aperture or the optical opening. The Mariner has broadband multicoated 40mm objective lenses that bring more from the stars among other heavenly bodies. At the backend, the eyepieces have the same coating. There are guards around the eyepieces that deliver easy observation mode, and no discomfort is experienced if you wear glasses. Feasibility extends to the quarter-turn rotation that puts them fully down or up. However, you might not get steady images while holding the pair unless you mount it on the tripod but the view is something you can use. If you are keen to note the smaller details, the objective lenses might be smaller than the specified 40mm diameter. While this is true as you are using them, when you open it and measure the diameter without the outer guard, the manufacturer’s length is correct as the length stretches to a full 40mm. Description: At approximately $35, the Celestron Cometron claims the second place on our list with an aluminum housing that is water-resistant but not waterproof. The rubber skin tucks well in the visible joints which could allow water in. The make is what brings the price down which makes it a favorite among the young astronomers. This Cometron that comes in black has the Porro design, a high preference in the astronomy world. The cast is however from the BK7 glass, the cheaper version. There is a difference when viewing from the end of the 7mm exit pupil if you are used to those with smaller choices. Young stargazers have more to gain from this choice since the larger exit pupil compensates their eyes. The pair is cheaper, though the design has been compromised to counter the small funds. There is a center focus knob that turns easily without disrupting the view, regardless of the weather. On the frontend, the 5omm objective lens allows a 6.8-degree FOV which is ideal for stars, planets and a passing comet viewing. User experience has however refuted the 6.8-degree claim, and it’s easy to judge it as 6-degree view – still wide to complain though. For a steady view, you need to hold the binoculars right to your eyes and let them rest there as you seat on the backyard lawn chair. Are you new to using binoculars? This one comes with instructions to guide you on first use. Description: The ergonomically designed Nikon ACULON comes in many colors other than the usual black. 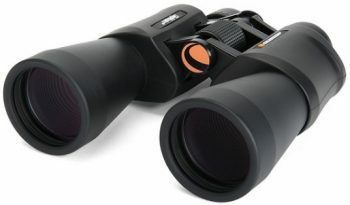 The highly-priced pair of binoculars offers high quality with middle range magnification choices. It’s considerably lightweight, and you can use it in any weather, thanks to the rubber coating that covers all the vitalities. Clear view of distant images is aided by the defined contrast, color, and brightness that work well when working on slightly higher magnification. This device is designed to use in different settings. Apart from the rugged design that makes them durable to withstand harsh weather conditions, the lenses possess an anti-fog coating that protects them while you are in the wild. If you are marine viewing, this option is waterproof, so sea water is not a problem. You can adjust the focus for a broader view especially if you are watching birds as you track their movement. The glass and lenses are made from spherical eco glass that performs well in varying light conditions. They are properly coated for protection and enhancing the viewing experience. The crafted aspherical eyepiece lenses provide a flat view as the multi-coating specification controls the brightness. It is easy to see distant images due to the 7x magnification that displays on the 50mm objectives. The actual viewing allowance of the objective lenses is 42mm. With a 6.4-degree FOV, you won’t struggle to catch a clear image as opposed to the 10x magnifiers that overpower your viewing ability. Porro-prism systems make the image clearer and distinct, and they are BAK4 to be precise. Your eyes find their relief from the rubber covering of the eyepieces. It’s 12mm which is a good deal for most of us. Though better image quality, user experience shows that there is barring and distortion on the edges. 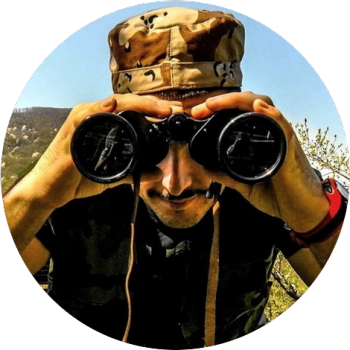 Description: Choosing a Celestron SkyMaster DX pair of binoculars means you get a highly priced device that is made to serve it’s every purpose while staying fit for the task. The 8x magnification that displays on the 56 mm objective lenses brings a better view of planets – more of brighter dots than fuzzy ones. The weight is bearable when using the equipment though it might feel heavier if you are using it for long hours. For the optics, the SkyMaster DX uses BAK-4, Porro-prisms that are fully multi-coated. This is the superior quality of the single and multi-coating specifications which improves the transmission quality but how? By considerably reducing the light loss and reflections hence a clear, bright view. The outer coating is waterproof and nitrogen purging aids in its durability when the weather is not conducive. Its rugged design that stimulates the imagery quality is a contributing factor the 5.8-degree FOV. It is easy to hold it by the hand when viewing distant objects. If you have tested the counterparts with the higher magnification, you can approve this choice of being steady. There is, however, a tripod adapter if the holding is a problem. The 7mm exit pupil gives a brighter viewing experience, and there is an eye relief that keeps your eyes away from the eyepieces curvature. The bigger the exit pupil, the more you get a better view due to the amount of light allowed. Also, included in the package is a protective case, a strap, and a red flashlight to study the star chart. It can be quite difficult when using it to view the stars. Check your requirements before buying this option. 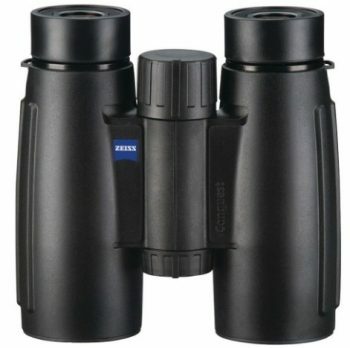 Description: At 1.1 pounds, the Carl Zeiss Conquest is lightweight enough for hunting among other outdoor activities. 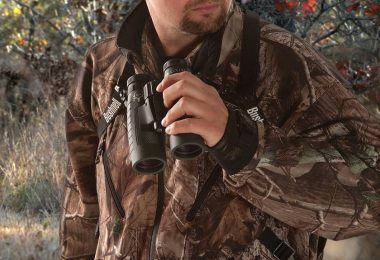 You get clear and crisp images of your target with the help of the 8x magnification and the 30mm objective lenses view. Sharp images are also guided by T lens multi-coating and the BAK-4 roof prisms with P phase coating. This is, however, a limitation on those looking for an astronomy-oriented pair of binoculars which specify Porro-prism design. The ergonomics offer smooth operation and holding mechanism since it is well balanced to provide comfort when using it for long periods; an advantage that has been experienced by reviewers. Since the rubber armoring has a rugged design, it is easy to hold it after a rough exploration accompanied by chilly weather conditions. Furthermore, the nitrogen-filling in the compact design eradicates any fogging attempt, while sealing makes it waterproof. At the back are eyepieces with an exit pupil measurement of 3.75mm, designed to offer comfort while viewing. They possess an eye relief of 14.6mm. The push and pull eyecups come with a twisting lock, but they can be rigid at first. Whole package contents also consist of a belt-looped Cordura pouch and a Neoprene strap to help you carry the binoculars. Zeiss owners offer a lifetime warranty on this option so if you get an authorized dealer, be sure to return it if something is inappropriate. Too expensive – It’s not a cheap item that you can recommend to anyone. 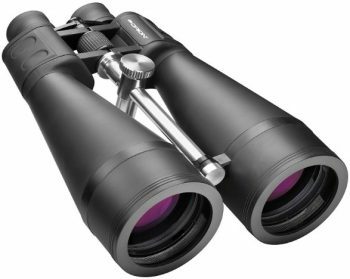 Description: You will choose Oberwerk Ultra binoculars if you like a better view via the large eyepieces which delivers a dominant impression of bright and sharp images. At 14 pounds, you can consider it as a heavy piece. Nevertheless, you can still hold them for short periods since the 11-inch length can provide a good balance. Long viewing hours may prompt you to use the tripod. The manufacturers included a cushioned strap that you can use to carry the binoculars. There is also a case for the device and a custom mounting ‘L’ fixture for the stand when you need to do some serious comet watching. They cannot stay still for long when handheld but the 15x magnification you get via the 70mm objective lenses pulls the objects much closer than the above models. The light allowance is given priority with the help of the broadband multi-coating of the optics. Perfect viewing is brought about by the BAK-4 Porro prisms and eyepieces with 4.6mm exit pupils. The eyepieces can focus separately as the fine adjustment range goes over 300 degrees. The 16mm eye relief does not compromise the view though eyeglass wearers have to fold the eyepiece guards down. For protection purposes, the rugged rubber armor design is waterproof with nitrogen purging preventing fogging issues. Description: Many of those who have used the Vixen Ascot Wide CFW have their reasons as to why they like it. 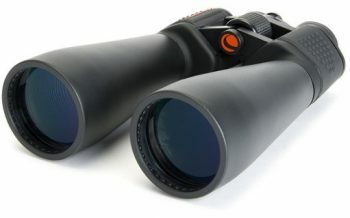 In astronomy applications, the binoculars have proven to be reliable due to the wide 8.5-degree FOV that is supported by the BAK-4 Porro-prisms. The result is a center focused image that is mechanically and optically appropriate for viewing. The plastic casing makes the cheap housing, but it is a good counter to solving weight problems. For enhanced light transmission and image sharpness, the optics are multi-coated – one of the reasons you will be able to see detailed views of the moon. The light transmission quality has proved to be worthy even in bad lighting. This equipment also boasts 10x magnification on the 50mm objectives, a quality that the experts would go with but not for the many who would favor 7×50 specifications. The eyepieces, on the other hand, have nothing much other than the 5mm exit pupil dimension and an eye relief of 7mm. Some users have complained of thin eye guards but viewing with eyeglasses is okay. You can use the center knob to measure the focus, and slight turnings can portray a significant difference. Pressing it in your arms as you view might, however, change the focus though it feels pretty light as you hold it. The tripod adapter cannot be ignored if you need to steady the image view. Description: For close to $130, the Orion Astronomy comes in with optics needed for planetary explorations. The outer casing consists of plastic and non-slip rubber that is water and shock resistant while the optics give you the intended view even in humid environments. You can roll down the eyecups for the eyeglass wearers though they appear to be quite cumbersome. The magnification is superb. With objects being 20 times larger through the 80mm objectives, it is a feature that you don’t get with the intermediary models. The view is closer to you with more details. However, the collimation can provide difficulties while trying to balance, but it gets better with continued use. These binoculars deploy BAK-4 Porro-prisms, and the lenses are fully multicoated, to bring in the needed light that nurtures bright and sharp images. Something to be concerned about is the eye relief. First, for a 20x magnification, the 4mm exit pupil might seem to be small, and the 10mm relief seems not to consider the eyeglasses. Another thing is the tripod adapter that comes inbuilt. While it is a wise move for the designers, you have to get the right specifications of the tripod to use. Otherwise, you may have to go extra costs of making the right adjustments for your tripod. They have however proved to be effective when using the camera stand. The collimation is something to struggle with at first. Description: The approximately $68 Celestron SkyMaster Giant piece has all the technical details needed for sky exploration. At only 3.28 pounds, it is light to hold it for a moment as the 15x magnification on the 70mm objectives brings the crisp and sharp images closer to you. Most of us would prefer this option if you don’t have a telescope since the 4.6mm exit pupil was designed with all viewers in mind, eyeglass wearers included. What’s even better is the 13mm eye relief. It also comes with a tripod adapter to help you overcome the friction and unsteadiness if you use a different tripod other than the specified one. Multi-coating of the optics is a desirable feature that adds value to the view. Why would many go for this option if they don’t possess a telescope? The magnified view has ample light fed in the binoculars as the BAK-4 Porro-prisms complete the view guiding task. Its light transmission has proved to be useful in the dark-sky environs due to the wide aperture. The outer rubber covering makes it water resistant and provides a firm grip. Center focusing is aided by a large focus dial, and each side can be attended to independently. After viewing, you can place it in the case after covering the lenses. The tripod adapter doesn’t provide enough grip if the stand is not binocular specified. 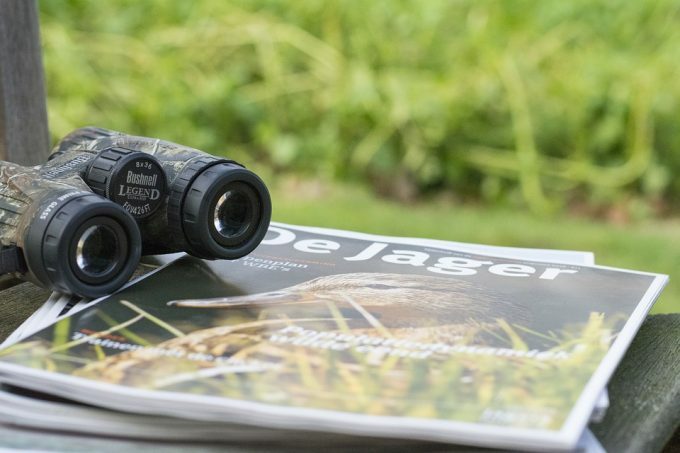 With the best picks reviewed when considering a pair of binoculars, it’s time to understand your needs perfectly for the best choice. Most of us get what they don’t want because some features are exaggerated. It might also occur to you that you didn’t go through what you need. 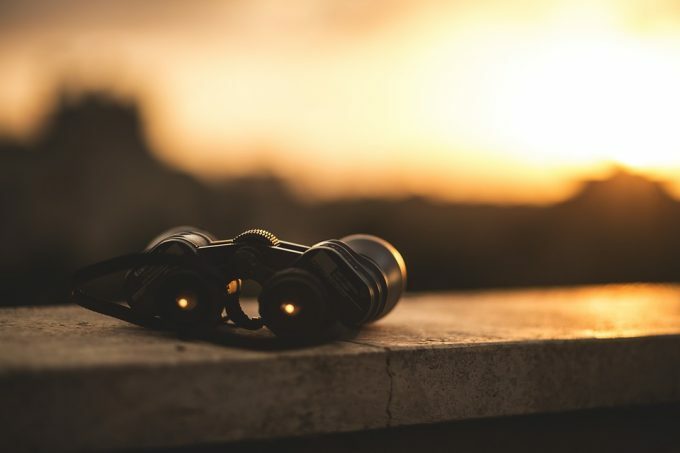 We have explored the major options and issues facing astronomers and beginners alike when choosing binoculars for the sky and distant watching. Is there anything missing? Feel free to share with us via the comment space below. We will be glad if there is anything that is worth sharing.